It's great with SuperD being at home a lot these days, it means that he is getting all creative!!! This is a sign for our shed (yes,.... what's wrong with that??) 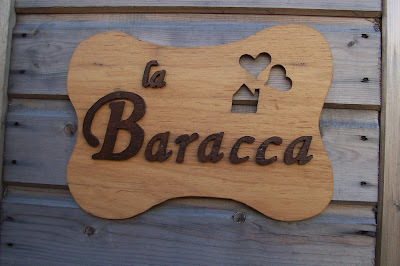 that is named after "La Baracca" meaning "The Shack" which is one of our favourite bars in Milano. Adding the little house and hearts cut-out design (all his own idea....i think my influence might be getting to him) made it extra fun! !